Airgas, Inc. (NYSE: ARG), one of the nation's leading suppliers of industrial, medical, and specialty gases, and related products, today announced that it has been recognized by Eastman Chemical Company, a Tennessee-based global specialty chemical company, with three awards for achievement in 2014: the Supplier Excellence Award, the Innovation Award, and the Sustainability Award. Airgas is the only Eastman supplier to have earned all three awards this year. Airgas was selected from Eastman's more than 6,500 global suppliers to receive the recognition for consistently delivering high quality products and services and demonstrating proven dedication to strengthening Eastman's efficiencies, competitive advantage, and sustainability improvements. Airgas, through its Kingsport, TN facility and Mid America distribution region, supplies Eastman with a wide range of industrial, specialty, and bulk gases as well as hardgoods related to welding and cutting. Airgas products are used at several of Eastman's manufacturing sites throughout the U.S., and applications include scientific testing, maintenance, process component fabrication, and instrument calibration. "Of Eastman's thousands of suppliers from around the world, we are proud to recognize Airgas, particularly its Mid America region, as a top-tier supplier by presenting them with our 'trifecta' of prestigious awards," said Willie Frye, Global Sourcing Manager for Eastman. "The Eastman and Airgas cultures uphold many of the same values, including safety, customer service, sustainability, and innovation; and for this reason we have enjoyed more than 15 years of very successful relationship. Airgas is truly a valued supplier and we congratulate them on this achievement." 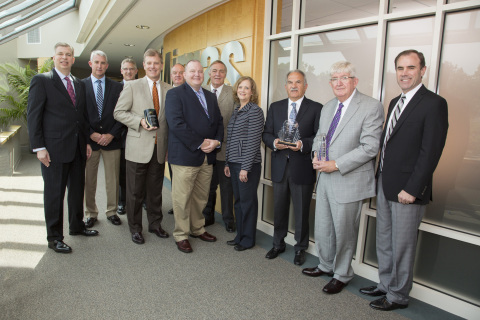 "We are honored to receive all three of Eastman's supplier awards for 2014," said Airgas President and Chief Executive Officer Michael L. Molinini. "Airgas defines success as helping customers grow by providing excellent service and industry-leading expertise. Our partnership with Eastman is a prime example of this success. We thank Eastman for the recognition and look forward to our continued partnership." Eastman's Director of Global Indirect Procurement and Supply Chain, Tina Davis, and Willie Frye presented Airgas management with the awards during a ceremony on August 6 at the Airgas headquarters in Radnor, PA.